The "El Venero" Estate is situated in a unique location, in the heart of nature, covering an area of over 20,000 m2 and is just 300 metres from the natural pools of the river Alberche and 500 metres from the town square. It is home to three Country Houses. The construction of the houses respects the traditional architecture of the area, with stone, wood and forging, all decorated in a rustic style. Two of them are practically adjoining. They are independent but can also be combined to accommodate large groups. One of the houses has 6 twin bedrooms some of which can be made into triples with an extra bed (optional), a lounge with a fireplace and TV and a dining room with large tables and TV, 4 bathrooms and a kitchen, as well as a vast gardened area with a large barbecue with light and water, and a splendid viewpoint. 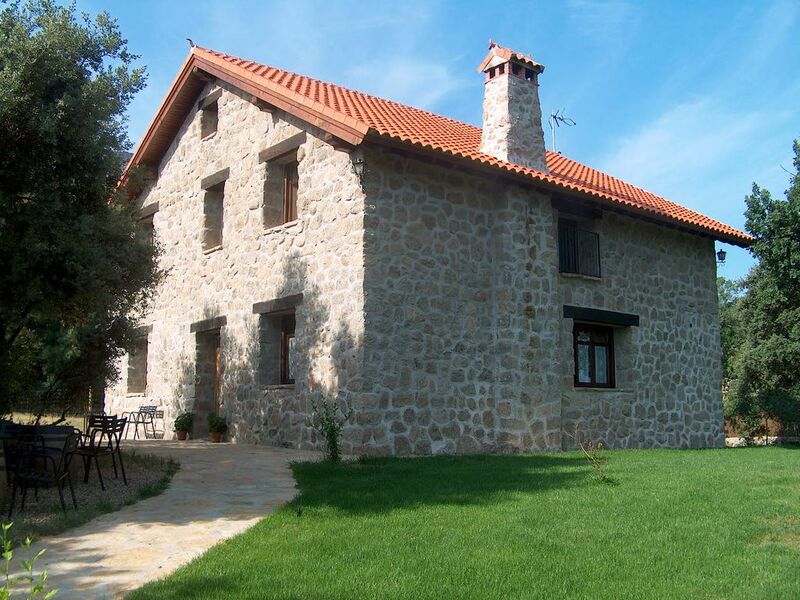 Next to it there is another house with a 70m2 lounge, with a fireplace and a wood-fired oven, kitchen and toilet. There are 4 ensuite bedrooms, double bed and single bed. Each house has its own barbecue with garden tables and chairs. In the estate there is a swimming pool for these two houses. There is also a large gardened area and a games area with goals and a volleyball net. The other house, which is newly built, is 100 metres away. It has the same characteristics but is much more spacious, designed for large groups, with 7 bedrooms (3 twins and 4 singles), a 60 m2 lounge with a fireplace, kitchen and 3 bathrooms. Large gardened area with a covered barbecue with light and garden furniture. Salt water pool and solar shower exclusively for use of the house. As well as the "El Venero" Estate we have a Tourist Apartment, "El Rincón del Venero", which is a very large house with 7 bedrooms; 3 double bedrooms, two of which are ensuite, then there are 2 triple rooms and 2 quadruple rooms with a bathroom and there is also a bathroom and a toilet in the hall. There is a dining room with a kitchen and large tables and a lounge with a fireplace and plasma TV, both of which are 35m2 each in size. There is a covered barbecue with light, tables and chairs. There is a small salt water pool and solar shower, which is 7m x 3m in size. The house is situated on an enclosed plot of 1000m2, on the banks of the river, in an area called El Rincón which is 2 km before you reach the centre of the town. In this area there is a multi-adventure park, a nature information centre and a golf course. It is also very near the Iruelas Valley Nature Reserve. Todo perfecto. Trato muy agradable. Desde el primer momento, a la hora de hacer la reserva, la propietaria Mª Carmen fue muy amable dándonos todo tipo de detalles e indicaciones. La casa es tal y como se muestra en las fotos (o incluso mejor). Todo limpísimo, un entorno precioso y tan solo a 5-10 minutos andando del pueblo. A la hora de la check in y el check out fueron todo facilidades por su parte. En definitiva, un alojamiento excelente al igual que el trato por parte de su propietaria. Hemos estado hospedados en la casa más alta el fin de semana del 4 al 5 de febrero de 2017. Somos un grupo de 4 matrimonios con dos hijos cada uno. Uno de los adultos tiene movilidad reducida, pero la casa en la planta baja, tiene todo lo necesario para disfrutar de ella. La casa en su conjunto es una "pasada". Bonita, grande, cómoda, muy limpia, calentita en la planta baja por la calefacción y la chimenea. En la parte de arriba hace un poco más de frío, porque la calefacción no es suficiente para calentar una casa tan grande. Hay un defecto, y es que la cocina no tiene horno. Por lo demás hemos pasado un fin de semana maravilloso, en un entorno precioso, en una casa maravillosa. Los dueños son muy amables y no nos han molestado en ningún momento. Lo recomiendo. Hemos alquilado una de las casas de la finca el Venero el fin de semana del 12 de Marzo. Nos ha hecho genial y hemos podido disfrutar de los bonitos paisajes de sierra. El pueblo tiene de todo, y recomendamos vermutear por la zona. La casa está equipada perfectamente, es super cómoda y y de calefacción va sobrada. Tienes chimenea y barbacoa exterior, al igual que un gran jardín compartido con minigolf, futbol voley y piscinas. Las camas son muy cómodas y los baños amplios y aseados. Es perfecta para ir con familias. Nosotros fuimos 15 chicos y repetiremos seguro! Estuvimos un fin de semana en la casa de 12 personas. La casa está muy bien, perfecta para ir con niños. Fuimos un grupo familiar de 14 personas a pasar el fin de año, y fue realmente maravilloso. El trato de Mª Carmen, fue exquisito y entrañable, ... así da gusto ir a los sitios. La casa es fantástica, con un salón enorme y habitaciones muy confortables. Estuvimos por la montaña, el pueblo, el río.... y en nochevieja hicieron en el pueblo una hoguera gigante!!!! La pena es que no dio tiempo para más. Muchas gracias Mº Carmen por tu atención tan dedicada desde que llegamos hasta que nos fuimos.